ArrowLabb(TM) Systems are complete all-in-one measurement systems. Instead of spending time purchasing equipment separately, ArrowLabb(TM) Systems combines your entire measurement solution into a single box. The most unique feature about ArrowLabb(TM) Systems is that you these complete systems not only measure, but they also graph and tabulate data directly on your PC in an easy to use format using a unique software program. After the success of our ArrowDox(TM) Micro Redox Measurement System and ArrowStraight(TM) Nitric Oxide measurement system, we have developed a large selection of all-in-one measurement systems which measure, tabulate and graph in one complete out-of-the-box solution. We now have systems for pH, redox, ions, nitric oxide and flow thru electrodes. Below is a list of ion systems we have created. Each system is geared towards a different type of research of sample type. Logs - Our exclusive software records details about your measurements straight to your PC for easy analysis. Graphs - Our exclusive software charts your data onto a graph so you can easily view and compare data. We have a large selection of pH electrodes which are compatible with all of our all-in-one measurement systems. This means that as the need arises you may order additional electrodes to add on to your system. Order now and we will give you 20% off any of our compatible pH electrodes that you purchase from us in the future. (Offer valid while supplies last.). To receive further information on any of our ion systems, fill in the form on the bottom of this page. System include macro ion electrode of your choice for measurement of your smallest samples. See standard sized ion electrode index for full pricing information. 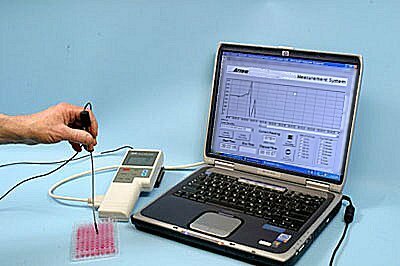 System include micro ion electrode of your choice for measurement of your smallest samples. See micro ion electrode index for full pricing information. System includes ion electrode with extra long cable for NMR tubes for measurement of samples inside your longest NMR tubes. See micro ion electrode index for full pricing information. System includes micro flow through ion electrode of your choice for flow through measurement of ions in small samples. See micro flow through ion electrode index for full pricing information. Looking for a specific system that is just right for you? We will be happy to assemble a system specific to your application. Simply fill out the form above including information on type of application you have and type of system you are looking for. When contacting us be sure to specify type of system and sale option you are interested in.